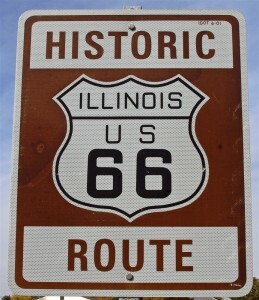 Route 66 was established as one of the original U.S. highways in November of 1926. It originally ran from Chicago, Illinois through Missouri, Kansas, Oklahoma, Texas, New Mexico, Arizona and California before ending in Los Angeles, covering a total of 2,448 miles. 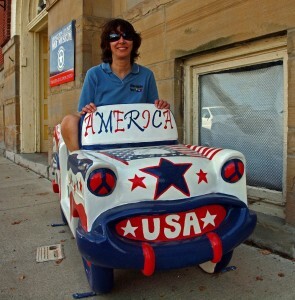 It offered freedom for tens of thousands of motorists who were eager to explore America. I have been fascinated with the Mother Road for as long as I can remember and that is the only reason we headed for Springfield, Illinois. I found a website before we left home that detailed some things to see between Springfield and Chicago. Unfortunately what it didn’t do is detail where the road was. Therein lies the problem with Route 66. It has been a long time since it has been a continuous, uninterrupted motorway. Now it runs for a few miles then joins the interstate, fragments or disappears entirely then suddenly appears again miles away from where you last left it. There are spurs shooting off it at various points that only add to the confusion. In downtown Springfield there are several parallel roads, all heading north out of town, all designated Route 66. We left the hotel fully anticipating a disappointing day not being able to find the road much less anything on it. As it turned out things went very smoothly indeed (relatively speaking) and I viewed the sighting of a deer near our first stop as a good omen for the rest of the day. I deliberately selected the most challenging site to start. From 1930 to 1933 Route 66 followed North Cotton Hill Road in Springfield, Illinois. In 1933 Sugar Creek was dammed to create Lake Springfield. The water level rose to cover a large segment of the highway. At that time Route 66 was moved to its current location of Interstate 55 to cross the newly created lake. The old pavement still runs through the woods here to where the road disappears into the lake…or so they say. I keyed North Cotton Hill Road into the GPS and followed the instructions to get there. As we drove through an obviously affluent residential neighbourhood toward the lake the road narrowed and we knew for certain this was it. Sure enough, there in front of us was a locked gate and the road just disappeared into the bush at the edge of the lake. I, for one, was thrilled that we were able to find this. I would not have given you a dime that we would have been able to do so. Firstly, it was in an incredibly obscure part of town and, secondly, was not marked in any way. This is indeed another good omen. Karen and I parked the van and proceeded to hike down the rapidly disappearing road. Suddenly it dawned on me that this was obviously no longer an official roadway and that we were quite certainly on private property. I just stood staring in awe at the sight of the road as it continued through the dense undergrowth then totally vanished with the lake shimmering in the morning sun in the distance. The next town up the road is Sherman and we were there before we even knew we had left Springfield. 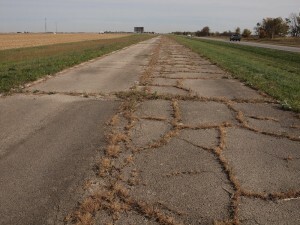 An abandoned stretch of early Route 66 (1926 to 1936) forms the eastern border of Carpenter Park in Sherman. Now listed on the National Register of Historic Places, the curbed concrete provides a longing look into the vintage past of the Mother Road. 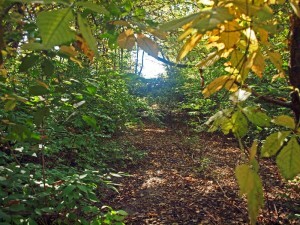 The original two lane highway complete with curbs lies in the tangled bush of the park. This was another stunning stop. 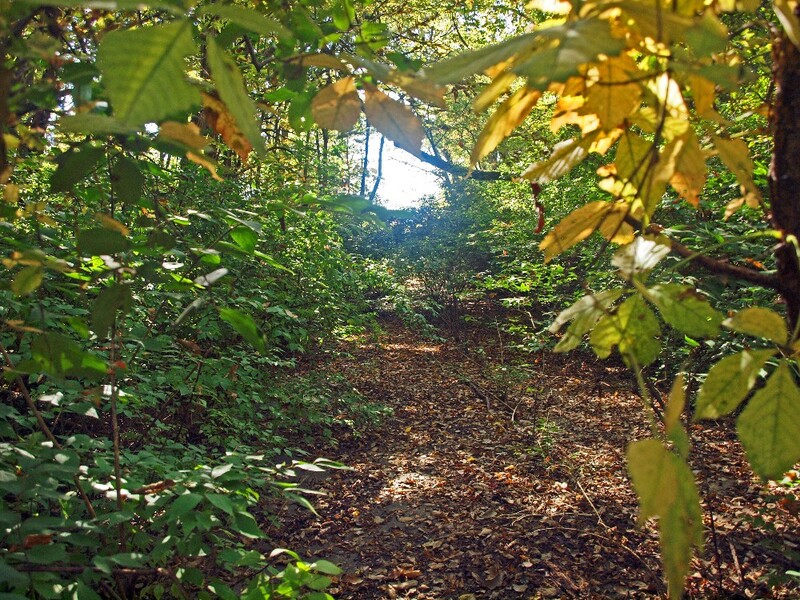 Walking through the woods on the overgrown road allows you to step back in time and imagine what it was like on this king of all roads in the days gone by. Atlanta, Illinois is one of those towns that just beckons you in off the highway and begs you to stay awhile. You have to leave the route on one of the spurs to get to the town but it is a worthwhile detour. The huge, yellow smiley face water tower greets you as you exit the highway and you are soon engrossed reading the vintage Burma- Shave signs along the right hand side of the road. These signs are entertainment in and of themselves. The Burma-Shave Company was well known for its advertising gimmick of posting humourous rhyming poems on small sequential roadside signs. Typically there would be 6 red and white signs posted along the edge of the road, spaced for reading by passing motorists. The sequence would always end with the announcement of the product. What a glorious memory of the fifties this was for me. The town of Atlanta celebrates the heritage of the Mother Road with pride. It is at the geographic centre of Illinois on old Route 66 and is also home to a true Route 66 curiosity. 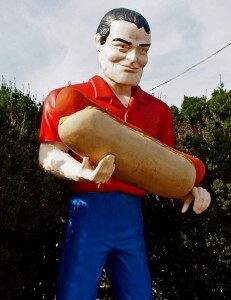 In the 1960’s huge, 19 foot, fiberglass “Muffler Men” were made to advertise auto service. In 1965 this Atlanta’s Muffler Man was purchased by Hamlet Arthur Stephens. 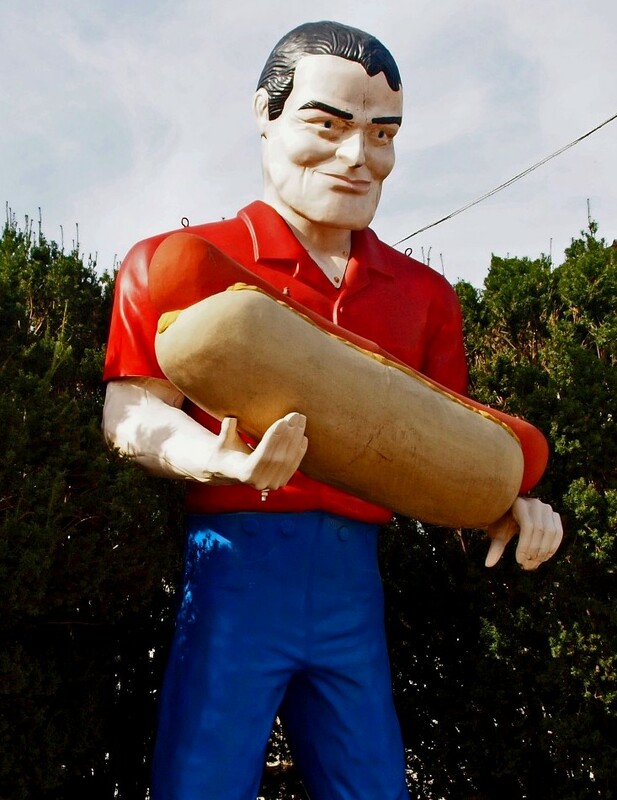 He replaced the muffler with a hot dog and placed the statue in front of his Bunyon’s Restaurant on Route 66 in Cicero, Illinois. The restaurant closed in 2003 and the Hot Dog Man was relocated to Atlanta so it could remain part of the historic Route 66 in Illinois. Just south of Bloomington I made 2 comments. One was that I thought getting through Bloomington on the route was going to be a disaster waiting to happen. The second comment was that the highway was incredibly well marked. No sooner had I voiced that aloud than we totally lost it. There was one sign missing and we were instantly clueless. We stopped to ask for directions and were told, “Don’t even try to find Route 66 in this city. It is so convoluted that you just will not find it.” We were advised to get back on the Interstate and get off at Towanda. That’s where I went wrong. I got on another highway I thought would work. It didn’t. After about an hour I realized this so we got off the highway and found we were 17 miles west and 15 miles north of where we wanted to be. So – time to backtrack. An hour later we found ourselves back in Bloomington. Well as it turns out it’s actually Normal. We didn’t even do that right. We managed to drive just a little over 60 miles today in seven hours. Progress is not fast but it is, in this case, the things of which dreams are made. I find it humourous and a little bit amazing that when you ask various local business owners where specific things along the route are they have no idea. We stopped at a gas station in Towanda. On the northern corner was a sign indicating Route 66 – made us feel a little foolish having just asked where it was. We then got our just reward when we asked where the “Geographical Journey Parkway” was. The cashier said she had no idea, so we left and I walked toward our van. As we were about to get in, about 10 yards from the window that this girl looks out of every minute of her day, we realized the parkway was right there on the southern corner – not 30 yards from where we now stood. Do you not think she might have seen this at some point? Even if she didn’t know what it was don’t you think she would have cause to wonder what this old road with signs from each of the 8 states that Route 66 traverses was? “A Geographical Journey Parkway” is a 1.6 mile testament to the Mother Road. It is an abandoned lane of the 1954 alignment dotted with educational kiosks that interpret each state along the road. Route 66 was originally 2 lanes, 18 feet wide, with barely enough room for 2 cars to pass. We had an absolute ball walking the old highway. Karen enjoyed reading the various educational signs at the kiosks and I reveled in the feeling I got of walking through time. One of the things we discovered on the walk was “Dead Man’s Curve.” It is a dangerous stretch of road known for its many accidents during the 30’s, 40’s and 50’s. Travelers unaccustomed to the curve misjudged its narrow width and sharpness – only 18 feet wide for 2 lanes of traffic and a 90 degree turn. A house located west of the curve was finally removed after being the victim of numerous crashes over the years. We, of course, had to drive on this intriguing piece of road. They say you cannot relive the past but I am one who is destined and determined to try. It is a shame that this relaxed, easy form of living has left us all in the modern, progressive dust. We need this opportunity to look back and experience our past. That’s what Route 66 was and is all about. Braidwood is home to the Polk-a-Dot Drive In. Offering both inside and outside seating it is a popular stop along Route 66. 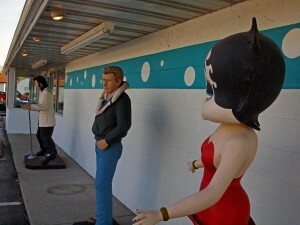 Fiberglass figures of Elvis Presley, Marilyn Monroe, Betty Boop, James Dean and the Blues Brothers adourn the outside. Marilyn was mysteriously missing from her perch and I quite frankly wondered just what the hell the Blues Brothers were doing here. This is a 50’s style drive in and I just don’t get it. Karen reminded me that Blues Brother Jake was from nearby Joliet and the other one was named Elwood after another neighbouring town but I still think it’s a stretch. At least they had the decency to hide them on the opposite side of the building. Inside it’s like a pop culture museum. The Elvis and Marilyn washrooms are well illustrated. I’ve been in washrooms that are a lot worse than flagrantly decorated with everything Marilyn. The jukebox was awesome because, to me, that is the icon of the 50’s. It’s when rock and roll music changed the world and is associated with so many happy memories. I found it very authentic, very charming and they have the most awesome chili fries ever! Wilmington gave us another Route 66 giant ex-Muffler Man and was indeed the only reason we stopped there. 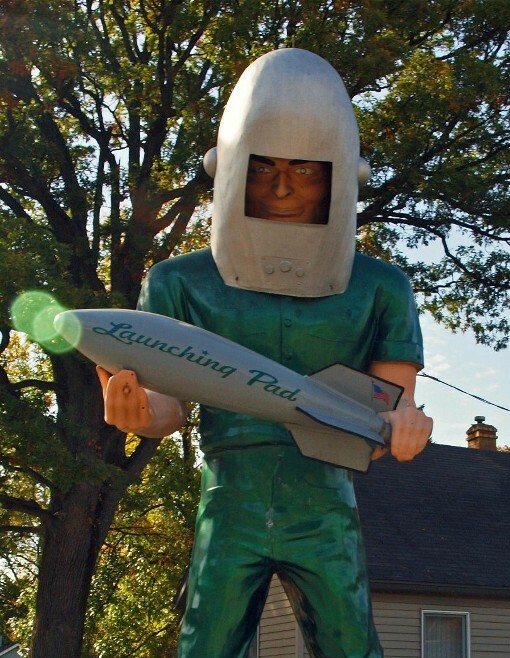 Founded in 1960, the Launching Pad Drive In is home to the Gemini Giant sporting a space helmet and rocket ship, paying homage to America’s fascination with the space program. The whole place has a homey atmosphere and is reminiscent of fast food establishments before the corporate chains standardized them and infused them with the stand offish attitude seen far and wide today. Henry’s Drive In in Cicero is a glorious old establishment topped by the most awesome sign of all. 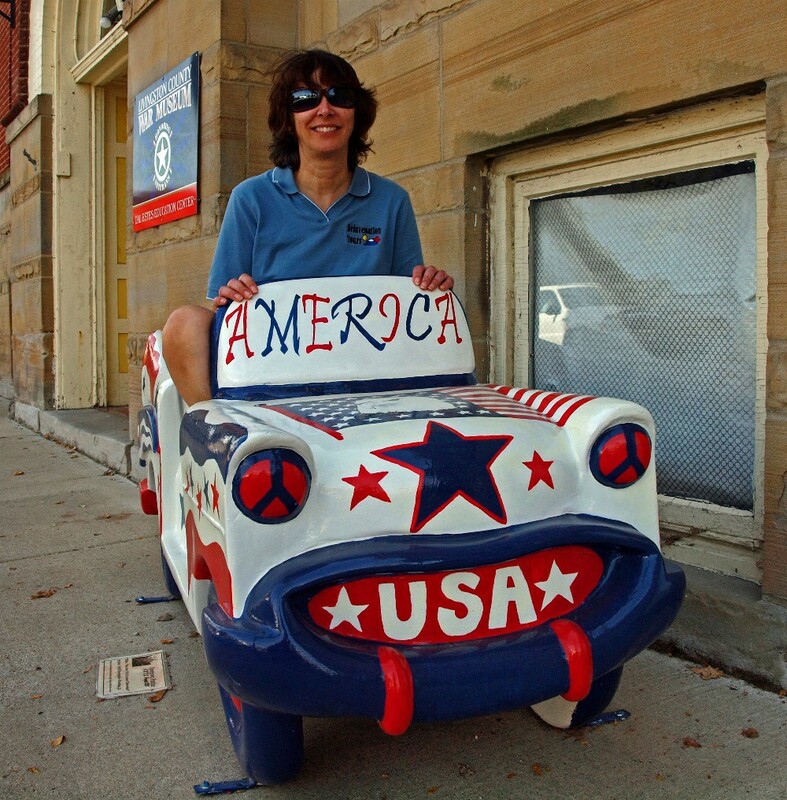 This fun Route 66 personality is a fitting conclusion to a fabulous pair of road trip days. We came to see what we could find and we found almost everything we looked for – now that’s something to cheer about.